Over 10 crore people in the country are getting water contaminated with excess fluoride : Most stunning admission by government. But it is not on the agenda of political parties. Karnataka Assembly elections are slated for May 12, and the major parties issued their manifestos, a formality completed very late. They promise many things from farm loan waiver, irrigation projects for the landed, to laptops and android phones. However, none of the parties bothered about the very basic issue of safe drinking water. In a pre-poll survey, by a media group, upto 37 percent voters identified drinking water as the number one issue and the most pressing issue. But the parties ignored the issue. They are so alienated from people’s lives. Union Water Resources Ministry recently identified, in 20 states, around 335 fluorosis-affected districts in India, out of which 24 districts are in Karnataka state. Only two or three districts, mainly in coastal Karnataka, (out of a total of 30) are totally free from it. It is estimated that people in more than 6600 villages of Karnataka are drinking water contaminated with higher fluoride involving a population of at least 60 lakhs who face the threat of fluorosis, unless countered effectively and in time. In particular, 12 districts of Karnataka, spread over all regions, are badly affected: Bellary, Tumakur, Yadgir, Gulbarga, Raichur, Koppal, Vijayapura, Gadag, Chitradurga, Davangere, Chikkaballapura, Kolar. Bengaluru city also has several habitats with high fluoride. However, no party bothers about this serious problem. Then, arsenic problem also complicates the situation in two districts : Raichur and Yadgir. Excess nitrates is another problem. Gogi village and its neighbourhood in Yadgir District of Karnataka, studied by FMRRC Karnataka, witnessed scores of un-natural deaths and physical and mental deformities caused by drinking water contaminated by fluoride, arsenic and uranium too. As part of a prolonged agitation, a memorandum was submitted to Sri Rahul Gandhi, when he came for election campaign, on February 12 last, by Bhoomi Tayi Horta Samiti (Mother Earth Struggle Committee) , of Yadgir dt., with the demand to commit to scrap permanently Gogi’s uranium project, suspended for the last five years due to public protests. There was no definite commitment. In fact, this is the case with India as a whole, and with many states that faced, and are going to face, elections. No party however bothers about such problems. Here is a brief Review by FMRRC, Fluorosis Mitigation Research and Resource Centre, based in Hubli, Karnataka, in this context. The present article, while seeking to dispel the under-estimation of the problem by various agencies, deals with the serious dimensions of the problem, based on a review of recent official data, and shows the neglect by various agencies, governments and political parties, and also the medical profession. Obviously, arsenic- affected habitations are larger in numbers than fluoride -affected habitations. While excess Fluoride is a slow poison, Arsenic is a deadly poison spreading in most of the Gangetic-Brahmaputra belt. More than one lakh villages are in this danger zone. This was one of the most stunning admissions by the government about the health status of the country in recent past. But it was not focussed by the big media, as it should have been: The polity, hence the big media, is lost amidst rapacious political forces working 24x7x365 to grab and retain power with no concern for the well-being of the people, more so the toiling masses. Amidst so many ‘welfare schemes’, and huge budgets, meant more to swindle funds than to deliver goods, the most serious problem of drinking water, of fluorosis, and of arsenicosis, continues to be neglected, despite the Indian State admitting its seriousness. In a pamphlet published years ago, with the caption, Beware of Fluorosis! we had mentioned that ‘ this disease is spreading! Lakhs of people are becoming handicapped!’ (It was also published in countercurrents.org on December 30, 2015). In it the FMRRC had said : ‘ The population threatened by fluorosis could have crossed 10 crores.’ The data, derived and projected from official sources, was doubted if not questioned by some people at the time. Now the Union Government said it. It is from the horse’s mouth. It is 10 crore people affected by fluorosis, and 7.04 crore by arsenic ! In many of the places in India, Fluoride, Arsenic, nitrates , lead, mercury, strontium , even uranium, etc in drinking water are playing havoc with people’s lives. This data, and not the 2018 February statement, is nearer the truth as can be verified from some previous reports mentioned below. The above , however, has one chief defect: That it is incurable is not true. Many studies showed the damage can be stopped, even reversed. FMRRC had stated this fact in several fora, official as well as unofficial. But we are not going into it now. Prime Minister Modi and BJP Chief Amit Shah have been campaigning, in Karnataka, with half-truths, promising development for all, sab ka vikas, ‘as in BJP-ruled states’ ! UP Chief Minister Adityanath too is pressed into service in Karnataka. Their performance in those states, UP included, is too poor for comparison, as can be seen below. It is an ever- increasing problem affecting the poor more. Governments have not so far taken commensurate steps to protect the large population. Swach Bharat Mission (SBM) is impossible without Swach Jal. Sab ka Vikas is not possible without safe drinking water to all. Make in India is impossible when crores of people, more so the toiling classes, are down with diseases and are crippled. But all these slogans are peddled. Fluorosis begins with dental lesions, seen mostly in children, but the damage is not merely cosmetic. Gastro-intestinal damage, skeletal and neuro-muscular, and metabolic degenerations etc are more insidious: Millions of people are literally getting crippled by fluorosis, with painful and stiff joints, and deformed bodies. 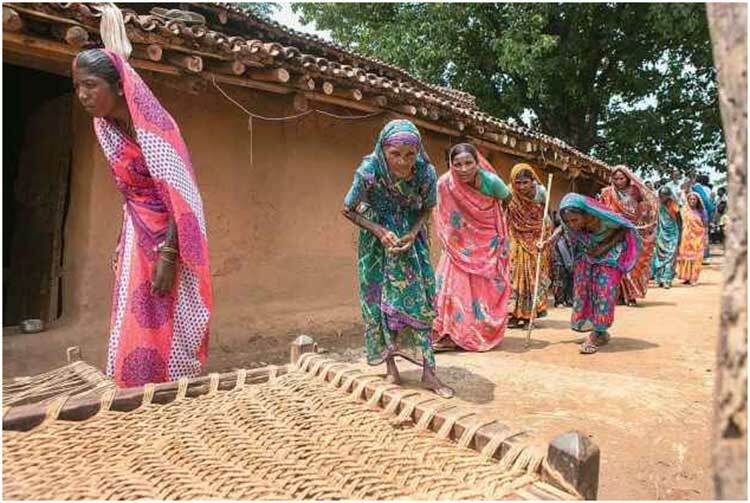 Given below is a photo from UP, Sonbhadra zone; the women are NOT of old age, but crippled by polluted drinking water. Number of affected habitations in UP, as elsewhere, has shot up and is shown as 179 for fluoride, and 748 for Arsenic in the reply to Loksabha given on on 20/07/2017. Earlier, on 09.02.2017, 31 districts of UP were listed for fluoride, and equal number for Arsenic. For other heavy metals like lead, chromium and cadmium, 17 districts are listed. Varanasi, promised by PM Modi to be converted into heavens on earth, features both for Fluoride and heavy metals. This despite hundreds of crores of rupees pumped in there. (The numbers are indicative, with so many errors including under-reporting.) In Bihar, it is admitted that around 23 districts are badly affected by Arsenic problem; it is 18 dts. in Assam; 15 dts in Haryana (apart from 20 with Fluoride. ); 8 in MP (apart from 39 dts with Fluoride.). Namami Gange Programme, an integrated conservation mission, was approved as the flagship programme by the government in June 2014 with a budget outlay of Rs. 20,000 crore. But the drinking water issue in UP remains unresolved. Number of affected habitations in Gujarat is shown, in the Annexure to the Loksabha reply, as NIL, not as NA (not available);it was so shown more than once. The fact is almost all districts (24 out of 25) of Gujarat are threatened by fluorosis. We do not know if it is a deliberate omission, yet another instance of post-truth? Other BJP-ruled states top the list in fluorosis : Rajasthan, all of its 32 Dts, is badly affected by Fluorosis. MP 39 dts, 12 of Haryana…Such is the vikas. Congress-ruled, ‘developed state’ of Punjab has it in all of its 20dts. It is a problem getting aggravated, not mitigated, as time passed. It is because of water table going deeper every year, by reckless and unscientific tapping of ground water. It was one of the unforeseen adverse effects of Green Revolution, pushed by the World Bank/IMF duo, and the Indian state, with huge public investments and subsidies on bore-wells, pump-sets and power supply. Now 335 Indian districts are admittedly affected ( almost half of India’s total districts ) with fluorosis. (District in India, unlike the connotation in the West, refers to a large administrative division, each with population often running into lakhs, some even more than a million.) Plus the Ganga-Brahmaputra belt, with another menace : Arsenic in water! A deadly poison! –1974: 25-30 million (2.5 to 3.0 crore) people at risk and half a million (5lakh) were reported crippled. –1999 (UNICEF): 201 districts affected and 60 million at risk. 6 million people crippled. –2009(Ministry of health and family welfare): 275 districts are affected and 66 million people are at risk in endemic areas. 6 millions are crippled. –2017 (Ministry of Water Resources) : Fluorosis in 335 dts, 10 crore people threatened. Arsenic 153 dts. ; 7 crore people by Arsenic in water. National Rural Drinking Water Programme. Estimates cited above from 1974 to now show that the situation got aggravated even as programs and plans existed, obviously ineffectively. The last four years of Modi regime ,despite tall claims, failed to rise to the occasion. Thus the question that arises : Swatcha Bharat – is it possible without Swatcha (pure and safe) water? In a country that has a defence Budget of around Rs. 4 lakh crore (2018-19), this issue is totally neglected, as can be seen below. Despite serious dimensions of the problem, admitted by the government, Budgets at the Centre and in the states are not reflecting the same. As usual half-truths are peddled. Union Finance Minister Arun Jaitley, it was reported, increased the allocation for the Water Resources Ministry by nearly Rs 2000 crore to Rs 8860 crore in the Union Budget 2018-19. The government claimed: Under the Centrally sponsored schemes, the National Rural Drinking Water Program has got a boost of 15.7 per cent for next fiscal. The scheme has been allocated an amount of Rs 7000 crore (BE 2018-19) compared to Rs 6050 crore last year. But the small print tells the reality: The Revised Budget (RE) 2017-18 was Rs. 7050 cr though BE was Rs. 6000cr. Thus instead of an increase, it is less than last year’s spending. In fact, allocations have been on the decline though the problem has been getting aggravated. Obviously Prime Minister’s show of SBM, more so its advertisements, dwarfed the allocations for drinking water. The Centre claims it is the responsibility of states, most of which (except Telangana) are equally negligent. For instance, the Karnataka budget 2018-19 is huge, Rs 2 lakh crore plus, up by 12 %. Out of that, health got Rs 6645 for health schemes. Specifically for fluorosis affecting 20 districts and 6600 habitations (as per FMRRC’s estimate), there is nothing specific. RO plants were pushed in Karnataka, but that is not the correct solution for fluorosis. Many RO plants are defunct for various reasons. Government of India initiated the National Programme for Prevention and Control of Fluorosis (NPPCF) as a new health initiative in 2008-09. During the 11th Plan(2007-12), 100 districts from 17 States were identified for programme implementation. During the 12th Five Year Plan period it is proposed to add another 95 districts for prevention and control of fluorosis. In the 12th Plan the programme has been brought under the NCD Flexi-pool of National Health Mission (NHM). Even as plans are drafted and revised on paper, the problem got more and more extensive and acute as seen above. NPPCF in Karnataka has not tackled the problem in any tangible manner. Both SBM and safe drinking water should have been inseparably linked, but that is not the case. The latter question never is given its due attention in the huge and costly propaganda campaign on SBM. It is the poorest of the poor, the toiling millions who are hit by these diseases caused by poor quality of drinking water. Dr. D. Raja Reddy, a pioneer in Fluorosis research, says: though the problem is endemic to certain regions, it is basically a poorman’s disease because toiling classes working in hot sun drink lot more of water, so ingest more fluoride; and malnutrition aggravates the damage. The same water impacts differently on the rich and poor. That is the source of neglect by the authorities as well as corporate medical industry. All the official data is based on flawed criteria, said the FMRRC years ago. Its pamphlet had said : ‘It is to be noted that fluorosis is caused by drinking water with fluoride above permitted levels. While BIS_IS : 10500-2004 prescribed 1mg as desirable limit, which is also the limit as per Indian Council for Medical Research(ICMR), which is an authentic and official body, the Government took Fluoride in drinking water at 1.5 mg/Lit as maximum permissible.’ Not that the standards are finally fixed and implemented. Union Minister for Food and PDS had said on 14-2-2015 : “ BIS (Buro of Indian Standards) is developing standards ….for public supply of potable drinking water… (they) will be made mandatory in a phased manner.” (Economic Times, 15-2-2015). A brief discussion of the criteria that follows here will be helpful. “This Indian Standard (Second Revision) was adopted by the Bureau of Indian Standards, after the draft finalized by the Drinking Water Sectional Committee had been approved by the Food and Agriculture Division Council. B u r e a u o f I n d i a n S t a n d a r d s BIS 10500 : 2012 DRINKING WATER — SPECIFICATION ( Second Revision ) says : “The second revision was undertaken to upgrade the requirements of the standard and align with the internationally available specifications on drinking water.” One of its bases was : WHO Guidelines for Drinking Water Quality, 3rd Edition Vol. 1, Recommendations, 2008. There is a variation, better now, only in wording : Requirement (Acceptable limit) ( earlier it was : Requirement, i.e., desirable ) and “ Permissible Limit in the Absence of Alternate Source” (no change in wording here.). However, 1mg and 1.5 mg are the respective parameters retained. An earlier BIS 105000 Standard For Drinking Water in its descriptive part says : “Fluoride in water above 1.5 mg/l is dangerous and causes a disease called ‘Fluorosis’ which affects the teeth and the bones of humans who consume water with high levels of fluoride.” What is cited years ago, above 1.5mg as dangerous, rightly so, is shown as Permissible Limit in the Absence of Alternate Source even after revision. And all the official data, including that given in parliament now in 2017, is based on these flawed criteria of BIS 10500 : 2012, taking 1.5 mg as the basis. And not 1mg acceptable limit. If 1mg Acceptable limit is taken as the criterion, instead of 1.5mg taken by the government, the numbers will surely multiply . Obviously it is all an under-statement of the grave problem. Experts’ consensus was that safety levels of fluoride in drinking water in India should be fixed at 0.5 ppm, as mentioned above. One can only imagine how the numbers will shoot up if 0.5mg is taken as the basis. There is also a medical quibbling here: Is fluoride required to counter dental caries, more so in India ? Dr. AK Susheela, an authority on the subject, firmly refutes it, based on extensive research and field studies. Many cases of dental caries as well as dental fluorosis were found in the same mouth, also in field studies by FMRRC in Pavagada and Yadgir areas of Karnataka. A comment made in 2003, by Sri V K Joshi former Director, Geological Survey of India is telling : “ The Bureau of Indian Standards (bis) standard for fluoride content is 1-1.5 mg /l. It is believed that levels above or below this could cause dental decay. Ironically, there is an increased incidence of dental caries, yellow teeth and twisted limbs among people of all age groups in India.” He listed pockets with Fluoride as high as 6 to 15mg . Several districts have multiple contaminants , hence the numbers overlap. National Rural Drinking Water Programme, Guidelines 2013, in the Annexure XI at section 1.0 Background says : Chemical contamination of drinking water, especially of Arsenic and Fluoride, is a major concern in drinking water supply. The number of habitations and population in States with at least one drinking water source affected with chemical contamination, as on 1.4.2011, is 1,21,501 habitations with 6.02 crore population. To build rural infrastructure, Bharat Nirman was launched by the Government of India in 2005 to be implemented in a period of four years from 2005-06 to 2008-09. Rural drinking water was one of the six components of Bharat Nirman. During the Bharat Nirman period, 55,067 un-covered and about 3.31 lakh slipped-back habitations were to be covered with provisions of drinking water facilities and 2.17 lakh quality-affected habitations were to be addressed for water quality problem. An investment of Rs. 22,462 crore under Central sector has been made on rural drinking water component during this period. As per latest reports, about 4.64 lakh habitations have been actually covered. In case of the remaining habitations, work has been either approved or taken up, and are at different stages of implementation. It is expected that by March, 2011, this task will be complete. While the progress of coverage reported was very impressive, rural water supply continues to be found wanting due to many reasons. If you take the data for number of ‘sources of water with single chemical contaminants’, as per 2017-18 data of the Ministry, 37145 sources are contaminated by fluoride above 1.5mg, and 8607 by Arsenic. This is apart from 56013 sources with “multiple contaminants” (Iron, Fluoride, salinity, nitrate and Arsenic). Rural poor are worst victims. Data given mostly pertains to rural areas. National Rural Drinking Water Programme (NRDWP) compiles and monitors the data. However, not only in villages, but in towns and cities too, people increasingly buy 20-litre bottles, with water collected from bore-wells and you are not sure of safety: The High Court of Karnataka was told by the state government that most of these water plants are not regulated. It is no different in other states. Given the ever-rising numbers, one can imagine how terrible and serious the problem has become by now. There is not much awareness, even in the medical fraternity, not to speak of common people. 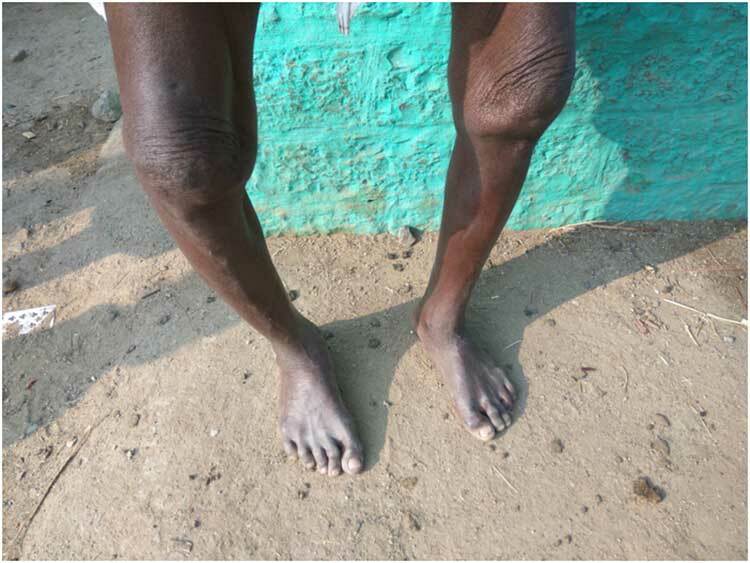 For instance medical literature even today often tells us that skeletal fluorosis is not treatable, not reversible. It is not true, reports across the world show it can be stopped, slowed, even reversed in several cases including skeletal fluorosis, more so in children, with no more than safe water and a little of good nutrition. Even within India, such reports are there.
. See the picture below: Fluorosis-affected children in Jhabua , Madhya Pradesh. (Notice the bent legs). Same children after 2 years of ‘treatment’ (Notice straight legs) i.e., supply of safe drinking water and nutritious food including some micro-nutrients like Calcium, Magnesium, Vitamins C and D. Radiological evidence for recovery is available about these children. Dr. D. Raja Reddy, ex-Director NIMS Hyderabad, and a pioneer in Fluorosis research led many such studies. Photo Below : Fluorosis affected children in Madhya Pradesh. (Notice the bent legs). 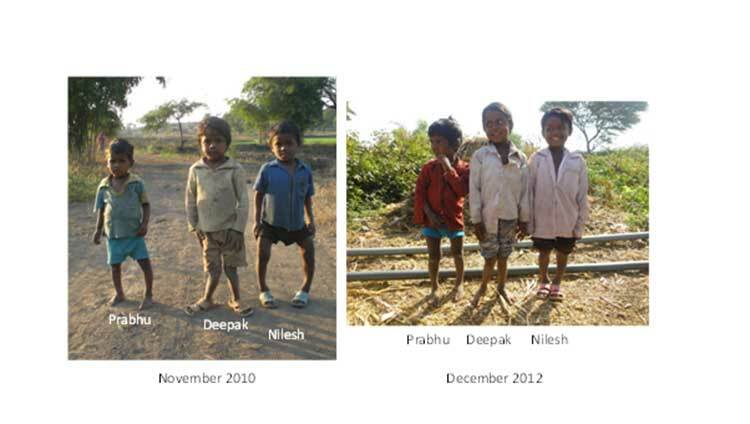 Same children after 2 years of treatment (Notice straight legs). There was little coverage of fluorosis in medical text books until a few years ago, though it was recorded and studied, in India too, since 1937, for more than eight decades now. Recently there is some coverage, often too little for a problem threatening 10 crore Indians. And the coverage is neither comprehensive nor free from defects. This is the source of poor awareness even among doctors. ‘Backward’ areas in India mostly report wide-spread poor academic performance by students, more so of ‘backward communities’, who face lives of poverty, deprivation and malnutrition. It is attributed often to genetics, but more than that, environmental factors aggravate the problem. And over generations, genetics itself is influenced by environmental factors. In fact, studies indicate a wide range of neuro-toxicity, with varied adverse effects on health. There is however callous negligence on these issues in the top echelons of the Medical education and Health administration, not to speak of corporate health sector. Doctors, including PHCs across India, almost never provide the prophylactic calcium, magnesium and vit C; it also helps mitigation; rather, they routinely dispense pain tablets (NSAIDs), which are also sold across the country, mostly without prescription too. Indiscriminate and prolonged use of NSAIDs leads to kidney damage, and lakhs of people are already down with it. And thousands died of it, as formally acknowledged in Andhra Pradesh. Instead of solving the root cause of water pollution , and supply of nutritional supplements, dialysis centres are proliferating, often with public funding, to make profits out of misery and disease. In times when billions are made out of diagnostics business, there are however hardly any diagnostic facilities available even in top corporate hospitals and diagnostic centres across India, including metro cities, to test fluoride in urine and blood. There is no differential diagonosis for so many health problems involving fluorosis in its various forms. Very few doctors and medical scientists are paying attention to the problem. Almost 80- 90% population in India use ground water even for cooking and drinking. And that is increasingly polluted, as acknowledged by top geologists (see below). These days, even in towns and cities, many houses are provided with bore well water, canned in 20-litre bottles, most of them sold admittedly by suppliers who are not properly regulated. It is also very true that there is no control or regulation on the supply, sale and quality of bore well water. Environmentalists are not much focusing on this crisis in the realm of drinking water. In an article aptly titled as “India’s groundwater is flooded with fluoride”, in 2003, V K Joshi former Director, Geological Survey of India had warned about the dangerous effects of consuming water with high fluoride. He wrote : “Since the last few years, many more deep bore wells are coming up in the country in an unregulated manner. Apart from these, untreated effluents from various (coal-burning) industries like thermal plants, steel, cement, aluminium etc. are contaminating water sources including wells with fluoride and polluting even the air with its volatile form. Further, unlimited amount of chemical fertilizers, more so phosphates, used in the fields also adds to the fluoride content in the soil. Environmentalists have been writing many things, but this focus on fluorosis has been missing.” Tens of millions of Indian children are affected by dental fluorosis, which is not merely cosmetic , but indicative of a deeper malaise that may aggravate, and in course of time , take other forms, like skeletal and neuro-muscular damage. ‘The World Health Organization (WHO) will maintain a high-profile focus on Universal Health Coverage (UHC) via a series of events through 2018, starting on World Health Day on 7 April with global and local conversations about ways to achieve health for all. So in this 70th anniversary year, WHO is calling on world leaders to live up to the pledges they made when they agreed the Sustainable Development Goals (SDG) in 2015, and commit to concrete steps to advance the health of all people. The Indian government only paid lip-service to SDGs. It is sad to note that this menace of polluted waters, including fluoride-ridden ground waters, plagues many regions in India right adjacent to rivers like Ganga, Brahmaputra, Godavari, Krishna, Malaprabha, Tungabhadra, Bhima. River waters are safer, mostly free from fluoride and the like pollutants. Big irrigation projects, with huge public investments, have been there basically to benefit the landed gentry. But they are not used to solve the drinking water needs of the rural poor, most of them landless and land-poor, who anyhow get no benefit of such projects. Their plight is only to face problems of displacement for the sake of these projects, often with no proper, adequate and timely relief and rehabilitation despite many awards and verdicts by the top judicial and official bodies in their favor. Surface waters, ie., rivers, lakes, rain-waters, are mostly free from fluorosis and conserving them is the real and lasting solution. Thanks to a prolonged and massive people’s movement in Telangana, more so in Nalgonda dt., drinking water had become a burning political issue. There was some response. In 2013-14, the then Congress government of AP, to avert division of the state, paid attention to it and laid drinking water pipelines for some of the affected villages to supply Krishna river water. It also set up RO plants (reverse osmosis) plants in villages to treat ground water, but it did not provide a permanent solution. But it was too little, too late. The new Telangana State (TS) government, post-bifurcation of AP in 2014, made certain tangible commitments on the fluorosis question in particular, on drinking water in general. Its Mission Bhagiratha is a project for safe drinking water for every village and city household in Telangana State, with a budget of Rs. 43,791 crores. The project aims is to provide piped water to 2.32 crore people in 20 lakh households in urban and 60 lakhs in rural areas of Telangana. The ambitious project will supply clean drinking water to all households in the state through water sourced from River Godavari (22 TMC) and River Krishna (19 TMC). The works will be completed by December 2018. Hectic work has been going on. The problem, however, does not end with provision of drinking water. The villagers consume rice, vegetables and fruits grown on water polluted with fluorine and the government’s next plan is to provide canal irrigation from rivers, and to improve ground water table, by repairing all tanks and lakes. It is a good beginning. New operational manuals for all irrigation projects and reservoirs in the State and setting up of Drinking Water Front of Telangana and Power Front of Telangana are among the slew of initiatives announced by TS Government. The Chief Minister on 29th Aug 2017 announced the measures at a crucial high level joint review. Drinking water supply would be top priority followed by irrigation, and industrial needs and power generation. He wanted the officials to establish a system for real-time monitoring of water availability in each project and follow instructions from the State headquarters to release water for various purposes. The Chief Minister asserted that at least 10 per cent water should be reserved for drinking water needs. All other solutions, like filtered water projects, are inherently flawed, merely temporary, not sustainable, and too costly. Based on various experiences and field studies, drawn from Karnataka, Telangana and Andhra Pradesh, and with its humble efforts, FMRRC, devised a program of SEAM, ie., sensitize, educate, agitate, mobilize, on drinking water. It has called for a movement for drinking water as a Fundamental Right. People across India need to act on these slogans. They need to learn from Telangana people. FMRRC has been in touch with groups across India like and Gujarat, besides those in Assam, Odisha, Kerala etc. It has been in touch with FAN, Fluoride Action Network and Fluoridealert.org, operating from USA. It is a gigantic problem facing India, more so its toiling masses. It calls for sustained efforts on the part of one and all.